Guests enjoy the privacy of their own room as a single traveller without paying the normal single supplement on our New Guinea circle voyages. 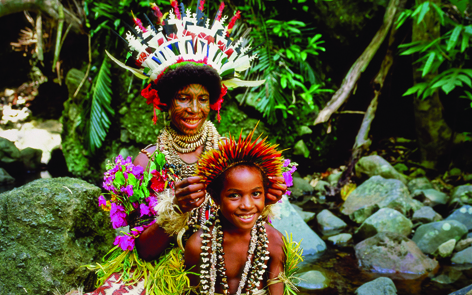 Rated one of the world’s top destinations for intrepid travellers, New Guinea is best experienced by small ship. Led by experienced guides, our coastal expeditions are safe, immersive and varied. Call us today for all the details 1300 76 86 96. Without your travel agent, you're on your own! Join the Coral Adventurer in 2019 for the inaugural ‘Customs and Craftsmen’ art themed expedition of Papua New Guinea, West Papua and the Maluku Islands. This exciting itinerary will spend a fully immersive 22 nights exploring remote villages and historic towns, focusing on art and culture and interacting with the local communities along the way. We will be joined by curator and expert on art, history and Pacific and Melanesian culture, Arthur Beau Palmer, who will be offering his expertise as a guest lecturer throughout the voyage. Arthur has been travelling to Papua New Guinea and the Indonesian islands since 1960, with his work as an anthropologist, ethnologist, and art collector. Arthur will be on hand to connect us with the tribal customs and artefacts of the region. Join us aboard Coral Adventurer over 25 unforgettable nights to experience some of the world’s most exotic and untouched regions as they emerge into the 21st century. This remarkable expedition will take you where other travellers have seldom visited, into the most remote corners of Papua New Guinea and Indonesia. Throughout the expedition you will also discover the very best that New Guinea has to offer, from the vibrant rainforests to the world’s most colourful and diverse coral reefs. Come face to face with villagers who until recently have been shielded from the outside world. This is the most comprehensive experience ever undertaken in this fascinating region.